This Place of Worship was founded in 1836, but we understand it was closed before 1960, and the premises are now in secular use. This building has been the Cotswold Playhouse for some years, at least as early as 1999. The flat-roofed extension at the front, and a smaller extension to the right side are additions to the original chapel building, which dates from 1835, according to Non-Conformist Chapels and Meeting Houses, Gloucestershire (1986). It can be seen on Old Maps, for example OS 1884 Town Plans, 1:500 as a Methodist Chapel (Primitive) with seats for 500. This map also shows a burial ground to the left, obviously the original graveyard. It was thought that there were some remaining memorials, which had been laid flat, but none were in evidence on our visit. The map also shows there was a Sunday School attached to the building at the rear, and - interestingly - a Well at the front, which the new portion must have been built over! Primitive Methodist Chapel (now The Playhouse), Stroud shown on a Google Map. Information last updated on 8 Nov 2018 at 16:25. 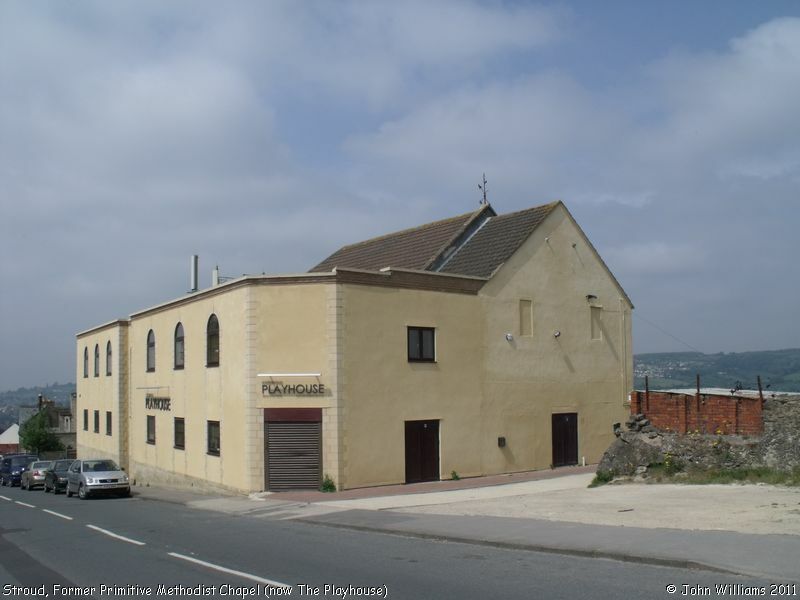 Please also remember that the former Primitive Methodist Chapel (now The Playhouse) is understood to be in secular use, so care should be taken to preserve the privacy of its occupants. This Report was created 8 Apr 2019 - 02:09:49 BST from information held in the Gloucestershire section of the Places of Worship Database. This was last updated on 7 Feb 2019 at 07:45.